With the ever rising costs of energy, we should all be looking at ways of making our homes more efficient. One of the biggest drains of energy and money in homes and businesses is the central heating system. An essential system, providing us with heat and hot water, the central heating system is a huge drain on resources. This gets worse as they get older. There are ways of making your central heating system as efficient as possible, many of which will pay for themselves over the years. Improving your central heating system will also help reduce your carbon footprint, there are many small ways to do this that will make huge differences to the environment. Many aging systems can be upgraded so that they can run much more efficiently. Power Flush Wizard can supply and fit any of the below for you, at very competitive rates. Getting your central heating system upgraded as well as power flushed will maximise the efficiency rating of your home, as well as saving you valuable cash. The build up of lime-scale within a heating system can cause a drop in efficiency as lime-scale deposits block pipes and radiators. A power flush will remove most lime-scale within a heating system and the chemicals put into the system will stop future build-up. But what about all the other pipes and taps throughout your house? These are not immune to lime-scale build up either, having a Scale Inhibitor installed onto the cold water inlet of your home will reduce lime-scale build up on ALL appliances that use mains water. They are quick and easy to install and require no maintenance. 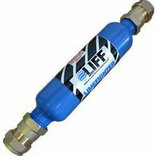 Ask us today about having a lime-scale inhibitor installed during your power flush. During a power flush all iron oxide deposits are removed from the system and the chemicals left in the system after a power flush can help reduce the corrosion process that produces black iron oxide sludge in your heating system. However these chemicals will only last for a limited amount of time, having a MagnaClean filter installed after a power flush will drastically reduce any further build up of this sludge. Having a MagnaClean filter installed will help you keep your central heating system running efficiently and save you money on future heating bills. Ask us today about having a MagnaClean filter installed during your power flush. 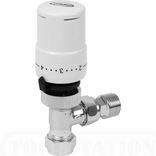 One simple way to control the use of heat in your home is to replace manual radiator valves with thermostatic radiator valves. These valves smartly increase and reduce the hot water flow to the radiator dependant on the temperature of the room. If the temperature of the room rises above a desired level the valve will lower the flow of water through the radiator, reducing its temperature. These valves are inexpensive and easily installed and are suitable for all types of radiators including towel rails. 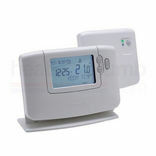 Be in control of the times and temperatures to which your home gets heated throughout the day. Wireless room thermostats can be located anywhere in your home to accurately gauge the overall temperature, and adjust the heating accordingly. These do not have to be wired into your boiler, so it is very easy to integrate these controls into your existing system. 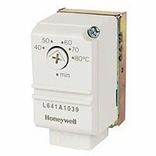 Honeywell Zone valves are an efficient way to control heating 'zones' on your premises, these valves are designed to separate your heating system up into 'zones' allowing you to only heat the zones you need when you need them. For example you can have living areas heated during the day and only bedrooms heated at night. Heating only the rooms you're using at the time you're using them can help to greatly reduce heating bills, saving you money. 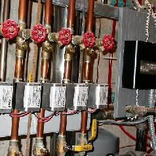 Cylinder thermostats regulate the temperature of the water in your cylinder. Instead of constantly heating the water stored within, the temperature sensor will sense when the water falls below the standard 60-65C and will heat the water until it reaches the set temperature. This saves considerable energy and will save you a lot of money over a year. The standard temperature is hot enough to kill bacteria in the water, and is still scalding hot, so heating hot water to above this temperature is not necessary. Having an un-vented water cylinder is another good way to reduce your heating bills. Water is only drawn from the mains cold water and heated when needed, this hot water is then supplied at mains pressure to outlets in your home. Heating water only when needed is more efficient than constantly heating water and as the cold water is drawn straight from the mains no cold water storage tank is required, saving you valuable space in your home. These pumps are the best way of helping maintain maximum efficiency in your system. 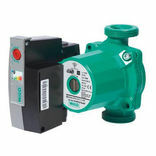 “A” Rated pumps use a quarter of the power needed to run the next best models on the market. Older pumps can typically be responsible for 10% of the total electricity usage in the standard home, so having an “A” rated pump will save considerable amounts of money over the year. If you are thinking of replacing your boiler, make sure you replace it with an “A” rated model. 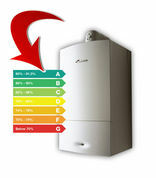 “A” rated boilers run at over 90% efficiency, compared to 70% that older “G” rated boilers. This can mean that with poorly rated boiler, or every £1 you spend on heating, 30p is lost. This is greatly reduced with the higher spec boilers. Replacing an old “G” rated boiler with a new “A” rated one will typically save the average household £300 a year. To increase this efficiency even more, consider a condenser boiler, as these recover heat lost from gases in the flue.